People always assume because I’m from India that my interest in the Caribbean must lie exclusively in the Indian components of the Caribbean. Nothing could be farther from the truth. I’ve been so little interested in matters pertaining to the Indian diaspora that it wasn’t until last month (after 25 years of being here), when I had to write a review essay of Gaiutra Bahadur’s superb Coolie Woman: An Odyssey of Indenture that I really started delving into the history of Indian indentured labour in the Caribbean. And having done so I’m finding it difficult to avert my gaze. Like myself not many Indians seem familiar with this classic example of subaltern history that is slowly coming to light once again with books like Bahadur’s. Scholars have studied and written on the subject for many years but it takes a book like Coolie Woman to bring the troublesome subject of indenture to the forefront of what I think of as the popular sphere. MEANWHILE ship upon ship of coolies from India kept coming – and kept coming steadily for almost another eighty years, by which time they outnumbered the Africans in Guyana. It is a forgotten journey; few, even in India, are now aware of it. The history was too minor compared to slavery and the Middle Passage, its damage not so epic. The ships sailed from Calcutta, and a few from Madras. The immigrants were drawn mainly from the peasant population in the Gangetic plains of the United Provinces–modern-day Uttar Pradesh and Bihar–and a minority from the presidencies of Bengal and Madras. They were mostly young and middle-aged, mostly male (which led to the sensation of ‘wife murders’ arising from jealousy), mostly Hindu, and mostly taken from the agricultural castes, lower castes and outcastes. The largest caste groups were the chamars, the lowly leather workers, and the ahirs, the cowherds. What was common to them was the fate they were escaping: the famines and revolts, the poverty and destitution of British India. Making their way, that is, from the mess of one end of empire to another. Lured by local recruiting agents and their tales about the land of gold, they set out to cross the seas. Crossing the sea: kalapani: this was the great Hindu taboo. It came with a loss of caste, of one’s place in the social order – but also, for the wretched, a liberation. When victuals among the castes spilled and mixed on the stormy waters, when each person was treated by the white man with equal indignity, the curse of being judged by birth was lifted. From here on they could be anything. 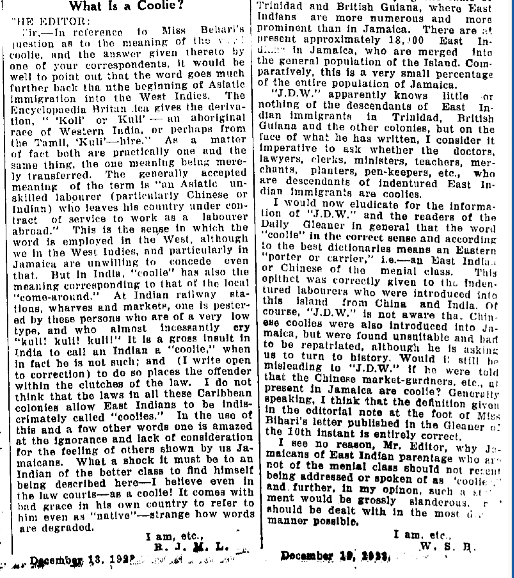 The policy made indenture a cause for the nationalists, who saw it as an insult to their dignity and self-respect, an attempt to make Indians permanent coolies in the eyes of the world..indenture offended the pride of Indians by “brand[ing] their whole race in the eyes of the British colonial empire with the stigma of helotry. But this shame over reputations as slaves paled in comparison to their anger over the sullied reputations of their women. In the review essay I mentioned at the top of this post I dive in-depth into the politics of the struggle over the status and conduct of indentured Indian women, about how Indian nationalists were incensed by the “harlots of empire” even more than the danger of being branded the helots of empire. I had to look up what helot meant actually–an interesting word meaning serfs or slaves–with a history dating back to Spartan times and referring to a subjugated population group from Laconia and Messenia who became state-owned serfs whose job it was to cultivate land to feed and clothe the Spartans. Their status was in-between that of freed people and slaves. For purposes of this post I want to stick to the other problem that worried Indian nationalists–that of being regarded as “permanent coolies” in the eyes of the world. It was one I found rearing its ugly head unexpectedly and perhaps by mistake when I first posted the link to Bahadur’s Coolie Woman on Facebook. 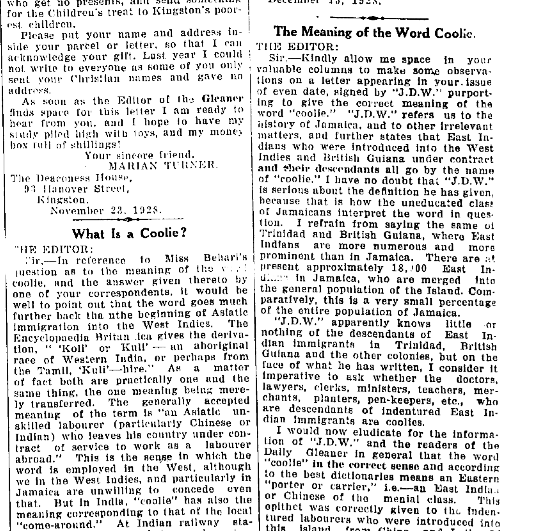 “‘Indian woman’ not ‘Coolie woman’” a well-meaning African-Jamaican friend responded, a bald declaration that crept under my skin and niggled at it. After an inconclusive back and forth during which she firmly maintained that the word “Coolie” was too disrespectful a term to use while I rankled at her presumption in blithely determining the vocabulary a young descendant of indenture was permitted to employ, I snapped something to the effect that the word ‘coolie’ is a living word in India today and is by no means a synonym for its 2 billion strong population. I’m convinced my Facebook friend didn’t mean to conflate the terms ‘Indian’ and ‘coolie’–and surely if we don’t want to be branded by the word we should demolish the conditions that continue to give it currency in the 21st century, not abroad now but at home–but I realise that the C-word as Bahadur calls it in her book, has a Caribbean history reflected in the discomfort my friend showed when she tried to erase it. 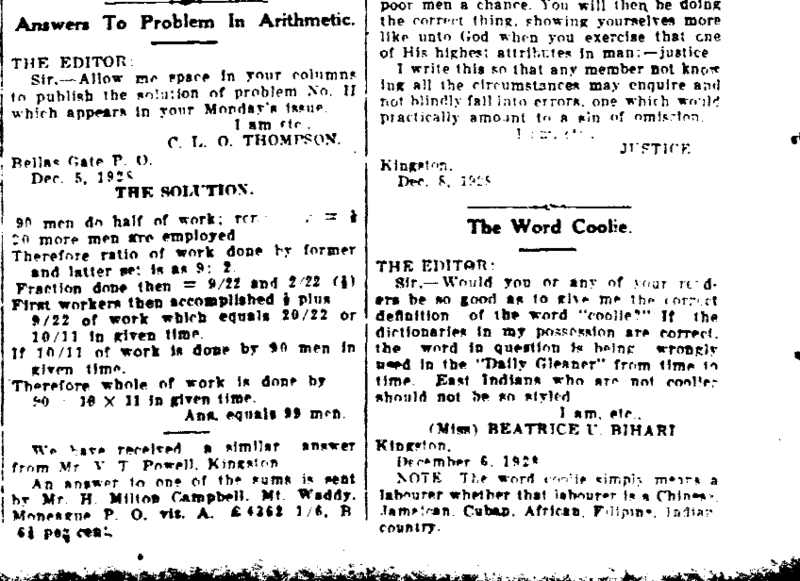 In places like Jamaica there were arguments in the local press about what ‘Coolie’ meant and to whom it could be applied which you can see reflected in the letters to the editor of the Jamaica Gleaner appended above and below. In Jamaica, the term ‘coolie’ was legally banned in the 1950s because it was used in a derogatory sense for an ethnic minority. This process began when the founder-President of the East India Progressive Society (EJPS), Dr. J. L. Varma, was popularly (but not abusively) referred to as ‘coolie doctor’. The EJPS then moved the government to ban the use of the term. Now my Facebook friend’s squeamishness at the use of the term ‘Coolie’ becomes clearer. But although laudable I wonder whether banning words or proscribing them ever achieves the desired outcome. Should we be trying to sanitize history or recording it in all its ugliness for the benefit of future generations? Can we ever liberate the word ‘Coolie’ from the unbearable weight of its history if its contemporary namesakes continue to work under the backbreaking conditions they do? These are hard questions for hard times.